IBM storage is proud to introduce our new twins, FlashSystem A9000 and FlashSystem A9000R, affectionately known as pod and rack respectively. The twins come from the loving family created by the marriage of FlashSystem (hometown Houston, Texas, USA) and XIV (hometown Tel Aviv, Israel). The twins share the same DNA but have taken on completely different appearances and capabilities. I have to say, as a member of one of the proud parent teams, the last two years have been a real eye opening experience. Any major system release is an exercise in coordination and collaboration, and this one crossed many time zones and cultures, to say nothing of merging technologies. The marriage of these two groups involved integration of offering management, product marketing, marketing, technical sales, sales, support, development, testing, and sales enablement. As a quick refresher, IBM acquired XIV in 2008 and Texas Memory Systems (now referred to as FlashSystem) in 2012. XIV’s claim to fame was taking the world’s least reliable disk technology (SATA HDDs) and packaging them into a highly reliable, scalable, and high performance enterprise storage solution. The Texas Memory Systems and FlashSystem claim to fame involved extracting the lowest possible latency from solid state storage media in a shared storage solution. It is obvious why these two solutions would be merged together, isn’t it? OK, so maybe it isn’t that obvious, so I will explain. Over two years ago, we were looking to the future and envisioning a world where solutions for the cloud service provider market took on increasing importance. The vision really crystallized in 2013 when IBM acquired SoftLayer. As with any initiative of this sort, IBM went through a buy vs build analysis. With the acquisition of Texas Memory Systems only having been recently closed, buying another all-flash array provider was not likely. A quick look across the storage stacks available from within IBM revealed some great options: the software behind IBM SAN Volume Controller, the software behind XIV, and what we now refer to as Spectrum Scale. We were looking for some key features: scalability, because we knew cloud service providers need to be able to grow with their customer base; quality-of-service so that our customers can prevent noisy neighbor problems in multi-tenant environments; multi-tenant management so that those tenants could manage their own logical component of the system; and critically, a team (the people) with the experience and resources to implement full-time data reduction so that we could help cloud service providers lower the cost of their all-flash deployments. When you put it all together, it was obvious that our best match was with the XIV software (and team). XIV, for years, had led IBM’s focus on cloud integration points, including many of the key features mentioned above plus strong links to cloud orchestration solutions from Microsoft, VMware, and OpenStack. Leaving out the details, suffice it to say there have been many IBMers crossing the Atlantic and Mediterranean in order to bring these new members of our product family to market. But the strength of the family is not just the individuals…it’s in the family itself and here is where our marriage makes even more sense. As much as we can see the future through our all-flash lenses, it is abundantly clear that customers will take a variety of paths and differing amounts of time to get there. Our combined family includes a true software defined storage capability in Spectrum Accelerate, a capacity-optimized solution with XIV, and a performance solution with the FlashSystem A9000 twins. In addition to sharing a software lineage, these products actually can share licensing. A customer testing the waters with this family could start with a trial deployment of Spectrum Accelerate, then actually buy software licenses on a per capacity basis for Spectrum Accelerate. Those software licenses are then transferable to XIV for low cost capacity and to FlashSystem A9000 for dynamic performance with full time data reduction. In the near future, customers will be able to asynchronously replicate from a FlashSystem A9000 to an XIV, enabling additional cost cutting for disaster recovery deployments. It’s been quite journey, literally, getting these two new products to market. But now that they’ve arrived, please join us in welcoming the twins to our growing FlashSystem family! So, it’s the 1980s or 1990s and you are building a solid state storage device with RAM. You can build it from scratch or you can take a computer with RAM, HDD and processors and a motherboard and turn it into a solid state storage device with a little bit of software. Which do you choose? If you’re in a hurry and have a short term view on the market, you take the fast way. How many companies built RAM solid state storage devices out of computers? Many, but zero that are still in business. Why are they out of business? Inferior product performance, inferior product cost structure, difficult to iterate without real engineering talent? All are reasonable answers. Many had their time in the spotlight but all disappear into history. When the engineering team at Texas Memory Systems had to make this decision they did what any self-respecting engineering team would do, they designed a solid state storage device from scratch. No kidding. They never made the RAM chips, but they made just about everything else. Why would you do this? I wish you could have worked with some of the Texas Memory System customers in these days. Their interactions with the engineering team are nearly legendary around here. Could it be that customers would complain about a few microseconds when the rest of the world was dealing in 10s of milliseconds? There were and they did. And these engineers reacted and tuned and shaved off latency. And that is where the story is kind of awesome, those engineers who dealt with those customers, those engineers are still at the heart, at the core, of the IBM engineering team for FlashSystem today. Now when someone comes in with a great idea, the first questions from these core engineers are what happens to the latency, what happens to the response time curve, how can we reduce the impact? This is not just an engineering goal, this is our engineering culture, the DNA that makes our products what they are. So in marketing, we call it FlashCore Technology and we even subject it to another descriptor called Hardware Accelerated I/O but you know now that is really a lie. The core doesn’t start with Flash, it starts with people and a culture built meeting the demands of the most demanding customers in the world. If you are looking for the technical depth in FlashCore look here. I feel strongly that 2011 will be remembered, at least in the SSD industry, for establishing the role of server-side caching using Flash. I recall soaking in all of the activity at last year’s Flash Memory Summit and being excited about the new ways Flash was being applied to solve customer problems. It is a great time to be in the market. I look forward to sharing more of the market’s evolution with you. For those of you who are interested, here is a link to a presentation that I delivered at the 2011 Flash Memory Summit on “Mission Critical Computing with SSD”. I have a point of view about third party caching (particularly as it applies to external systems as opposed to caching at the server with PCI-E) that is different than many in the industry. Some will see this as bashing of some particular product, but it is not intended to be that. As far as I know, I am not competing with a third party caching solution at any customer site. My goal here is to start a discussion on third party caching, I will lead with my opinions and hope that others weigh-in. I am open to changing my mind on this topic as I have numerous friends in the industry who stand behind this category. • RAID systems increasingly offered reasonable cache levels narrowing down the field of customers that need write caching. At the time we offered this RAM write cache, we thought that Xiotech customers were the perfect target as they did not believe in write caching at the time. Fact is, the combined solution worked out pretty well but was only useful until Xiotech realized that offering their own write cache could solve most customer problems. • Third party write caching introduces a point of failure into the solution. If you write-cache, you have to be at least as reliable as the solution you are caching otherwise you have net lost the customer reliability. • Write caching is nearly impossible if the backend storage array has replication or snapshot capabilities. Arrays with snapshot have to be cache aware when they snapshot or else they risk snapshotting without the full data set. I have seen companies try to get around this but most of the solutions look messy to me. • Putting a third party device from a small company in front of a big expensive product from a big company is a good way for a customer to lose support. We realized early on that the only way for this product to really succeed was to get storage OEMs to certify it and approve it for their environments (we did not do very well at this). • A third party read-only cache adds a write bottleneck (as writes to the cache have to be subsequently written to the storage). i.e. Latency injection. I assume there are architectures that get around this today. • A third party read only cache really only make sense if your controller is 1) poorly cached or 2) does not have fast backend storage or 3) is processor limited or 4) has inherently poor latency. This may be the real long term problem for this market. Whether you talk about SAN solutions or NAS solutions all storage vendors today are offering Flash SSD as disk storage. In SAN environments, many vendors can dynamically tier between disk levels (thus implementing their own internal kind of caching). NetApp has Flash PAM cards. 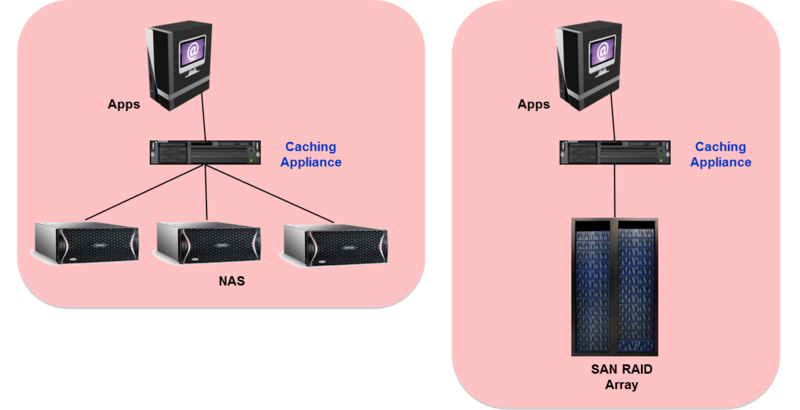 Both BlueArc and NetApp can implement read caching. The only hope is that the customer has legacy equipment or poorly scoped their solution such that they need a third party caching product. • Third party caching creates a support problem. Imagine you are NetApp and the customer calls in and says I am having problems with my NetApp storage can you fix it. Support says, describe the environment. Customer says “blah…blah…third party cache cache…NetApp”. NetApp says “that is not a supported environment”. I always saw this as a major limiting factor for third party caching solutions. How do you get the blessing of the array/NAS vendor so that your customer maintains support after placing your box between the servers and the storage. • Third party read caching solutions cannot become a single point of failure for the architecture. So, there it is. I am looking forward to some insightful comments and feedback from the industry. As you can see many are my opinions are based on scars from prior efforts in this segment and not meant to be a reflection on existing products and approaches.